Do you control your money or does money control you? Do you ever wake up in the morning and groan, I don't want to go to work today? Then you think about all the bills you have to pay, drag yourself out of a warm bed and go to work anyway. Does it seem like you never get ahead financially? Does debt cause you worry and anxiety? Do you want to gain control of your money and your life? Nobody should be a slave to their finances. Read this book and transform your life! U.S. consumer debt recently hit an all-time high of $2.35 trillion and millions of people are struggling to make ends meet. 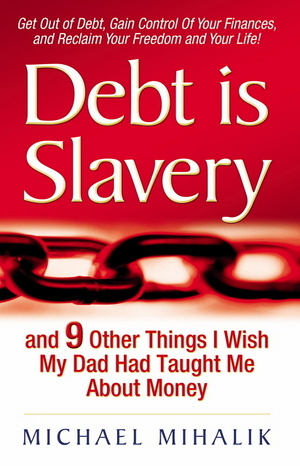 Debt is Slavery: and 9 Other Things I Wish My Dad Had Taught Me About Money takes a unique approach to personal finance by focusing on changing the way people think about money so they can regain control of their finances and their lives. Michael Mihalik uses his personal triumph over paralyzing debt to illustrate 10 lessons that will transform the reader's relationship with money so they too can pay off their debt and experience more fulfilling and prosperous lives - free from the shackles of debt.